Late winter/early spring in the mountains is a wildly varying time of year with highs in the 80s and freak snowstorms. One pleasantly warm day we went for a hike with my mom up in Panthertown. 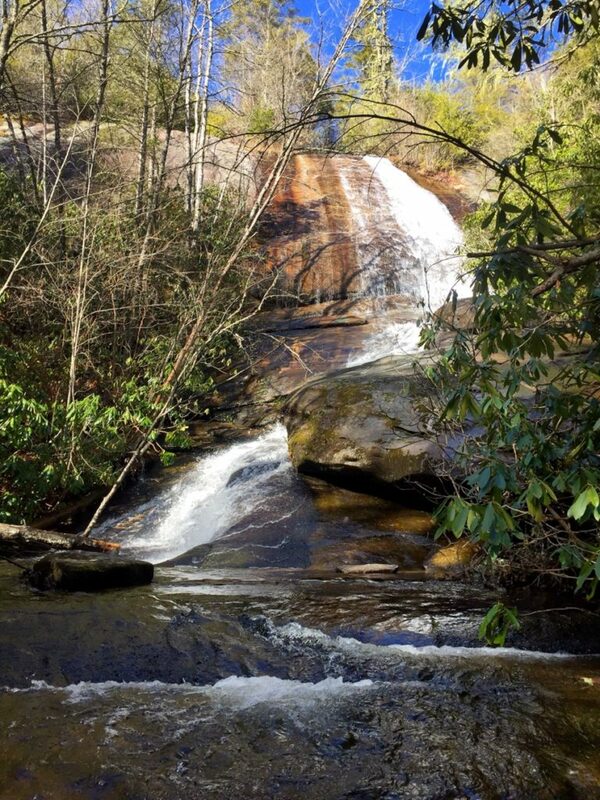 Panthertown is a lovely piece of National Forest land straddling the border of Jackson and Transylvania counties. 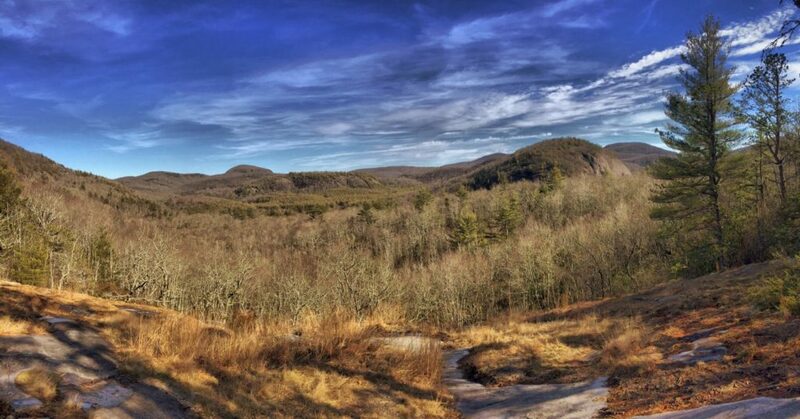 Called by some “The Yosemite of the East”, it features broad vistas, shining granite cliffs, several waterfalls, and a miles of mountain biking trails. The Jackson County entrance to Panthertown is Salt Rock Gap. It’s about 20 minutes from the cabin and probably the same from Cashiers. Not so much because of mileage, there just isn’t a straight way to get there. The Forest Service recently fixed up the parking lot for the Salt Gap Entrance, so unless it’s a busy day, keep driving until you get to it and ignore any cars parked along the side of the road. The main trail through the valley and the one from the parking lot is the Panthertown Valley Trail. It is a wide old road bed, probably a logging road, that runs through the park all the way to the Transylvania County entrance on Cold Mountain Road. There is a sign in box not too far down from the entrance where you can sign in and out since this is practically a wilderness area. Only recently did the trails gain signs and markings, and many people have gotten lost and turned around in these woods. Today we decided to take the Wilderness Falls Trail. It is the first trail to the right off Panthertown Valley Trail. This early in the year, the deciduous trees are bare, but the rhododendron thickets provided a nice green relief of the umber and ecru of a winter forest. The trail winds around and sections of it are craggy with roots and some steps. Keep an eye out for blazes on trees to keep you on the trail. The first waterfall you come to is Wilderness Falls. The waterfall tumbles down a steep slick rock face to make a hard turn at the lower boulders. The trail follows the creek on to the next waterfall. The water is so clear! The second waterfall on this trail is Frolictown Falls. 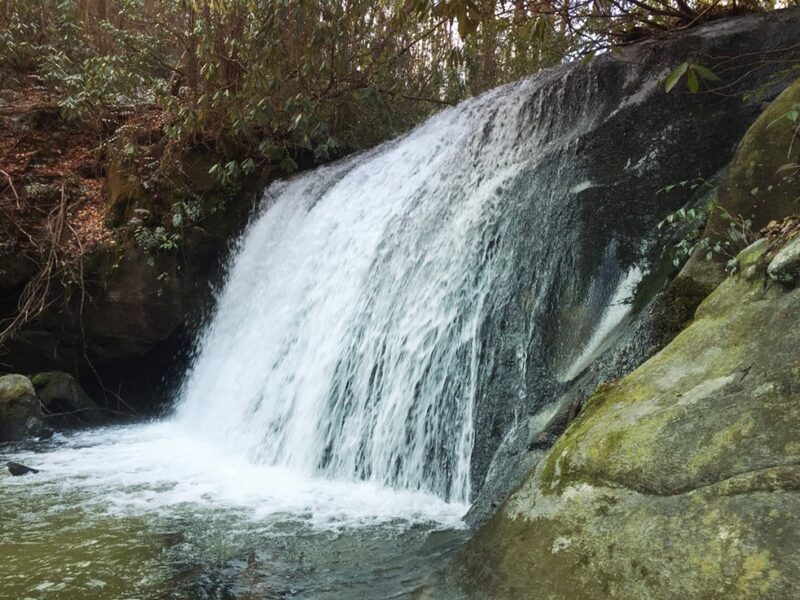 It is just at the intersection of Wilderness Falls trail and Deep Gap Trail. Turn left on Deep Gap Trail and take the first side trail down the hill just below the trail. This turns back to the bottom of the waterfall, which is a stunning miniature waterfall, straight and wide. This would be a perfect picnic spot. We returned to the trail and followed it back to Panthertown Valley Trail. Turn left to follow the trail back to the parking lot. About midway back, there is a great view of the Panthertown Valley on the right. No matter the time of year, this is a great place to explore. From the cabins, turn right on Hwy 107 (toward Cashiers). In 8/10 mile, turn left on Bee Tree/ Cedar Creek Rd. Turn right on Cedar Creek Road in 4/10 mile. Follow Cedar Creek for 3 miles, until you get to a stop sign. Turn left onto Breedlove Road and follow it to the end (3.5 miles).